I don’t know if you know about this thing called TCAF? It is where loads of awesome people gather near the beginning of May? This year, the main exhibition days are May 11 and 12, but there is lots of stuff happening in the week before and after, and the whole month in fact. Like this art show at a beer factory. Art + beer = Sign me up. You should totally come and check it out. But if you need another reason to check it out, how about insanely talented Japanese artist Taiyo Matsumoto? You know, the guy who wrote Ping Pong? And Tekkon Kinkreet? And so, so much more? TCAF is putting on a big show of his work, the first of its kind in North America and not much to compare with it even in his native Japan. So it is kind of a big deal. And in my capacity as “Japanese guest liaison” for the festival (I love this title, makes me feel like I am always wearing sleek black suits with my hair pulled back into tight buns), I will be escorting Mr. Matsumoto around town and making sure something in English happens at his speaking events. He is pretty good at handling the Japanese part; hopefully, I will be equally good at handling the English. Because I really want people to fall in love with him like I have. Not only because he is a super-nice, super-sweet guy (because he is), but also because his work just grows more and more compelling and interesting. I’ve read some of his work before this, but to prepare for working with him at the festival, I have been going back and reading and re-reading everything he’s written that I can get my hands on. And he has written a lot of stuff. Going through twenty years of work in a two-month period allows you to really appreciate how an artist has developed. (And being bilingual allows you to appreciate how his translators and the very notion of translation in manga has developed. Thoughts for another time, perhaps.) 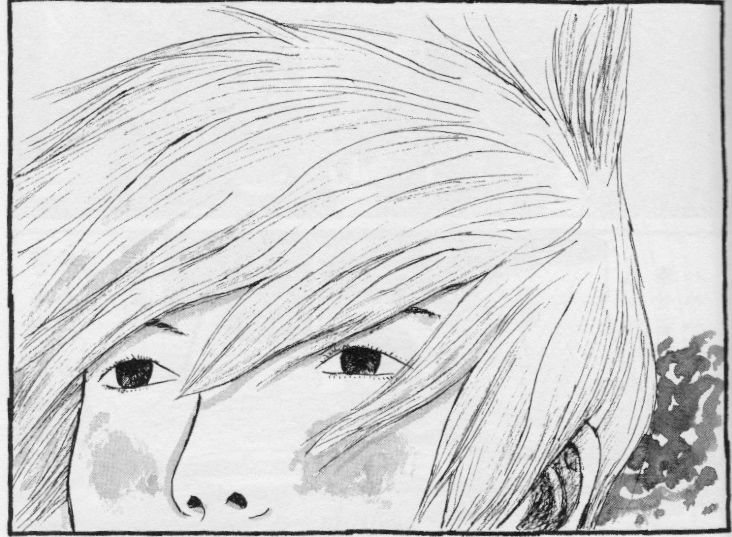 Moving from Hana Otoko, one of his earliest works, to Sunny, his most recent, is almost shocking, both art- and story-wise. The thing that struck me the most about Sunny was girls! There are girls in this story! To be honest, as much as I enjoy his artwork and his storytelling style with all its intense motion, I was starting to get a little disheartened at the lack of anything not male in Matsumoto’s universe. I think the only woman in Tekkon Kinkreet is the lover of the gangster Kimura, which is what I would call a bit part at best. For the most part, Matsumoto’s worlds seem to be impossibly populated by guys, so much so that I have caught myself wondering more than once how all these people ever came to exist if there are no women in their universes. So you can imagine my delight at seeing numerous characters of the female persuasion show up in this latest work in more than just bit part form. Sunny takes place in a kind of orphanage/children’s home in the seventies run by an elderly housemaster, who mostly just sits in his office and listens to the children’s voices, together with a couple of full-time, seemingly live-in staff members (one of whom has lady bits!). The children range in age from tiny (girl!) baby to nearly grown high schoolers (including a girl! ), although the story generally focusses on the group of third graders in the house (including two girls!!). As a friend said to me before I started reading, it’s heartbreaking. These are kids who have been left by their parents generally for reasons unknown. It is revealed later in the series (spoiler!) that Megumu (girl!) at least is an orphan, but the others seem to have been left by their parents in arrangements that are unclear. I appreciate this lack of clarity, though, since it seems to reflect the perspectives of the kids. They don’t know why their parents had to leave them, so neither do we the readers. We just get to follow them through their daily lives in the home and watch how they deal with being left there. The art is so, so perfect for the story, I can’t even begin to express how in love with it I am. It’s all pencilly and watercolors, and has a feel of a seventh grader doodling in her textbook. You know how your friend in junior high would draw a dog and you would be all, oh my god, that looks totally like an actual dog? Matsumoto draws that dog. And not because he couldn’t draw a dog that is way better than this dog, but because this story about these lost kids really needs drawings with that skillfully crude edge to them. He also has a tendency here to pull in suddenly for a close up of a kid’s face in a way that is so moving and pushes the story forward in a very intangible way. Only Volume 1 is out in English, compared to three books in Japanese, and having read all of these, I have to say I feel a little sorry for English speakers on this one. And not only because you have to wait longer to read these books. The translation is without a doubt a good one, faithfully conveying meaning from one language to the other. But Matsumoto writes Sunny in the Kansai dialect of Japanese, which is basically my favourite dialect and I never stop dreaming about moving to Osaka just so I can learn it. And it creates a particular atmosphere in the Japanese, especially given the contrast between the local dialect that the kids speak and the Tokyo dialect that new kid Sei speaks. That atmosphere is essentially lost in the English translation, which puts everything into standard American English with some “ya”s tossed in for variety. I understand the thinking behind the decision to lose the dialect (we don’t generally write in dialect in English, it sounds forced, etc. ), but I wish there had been a way to keep the dialect because so much of the richness of this story is in the language it uses. Like all stories, I guess. PS. Come see Taiyo Matsumoto at TCAF and say hi to me! I will be in an interpreting daze and so I will not remember meeting you, though! Just a heads up! OMG!!! I wanted so much to attend this event! I was planing to come to Toronto since my brother is currently working in Montreal, but it is impossible because of my work schedules. I wanted to see Matsumoto and the exhibition about his works so much. I am a great fan of his manga, and I’ve got everything translated in French by him (and even Hanaotoko and Zero in Chinese because they are not translated…). I’m still waiting for a French translation of Sunny since we got Tekkonkinkreet, Blue Spring, Brother of Japan, Ping Pong, Number 5, Gogo Monster, Takemitzu Samurai translated. Cross the fingers! Have fun at TCAF, I would have said hello if I had the chance ;). I’m so jealous (+, you’re English-Japanese bilingual)! 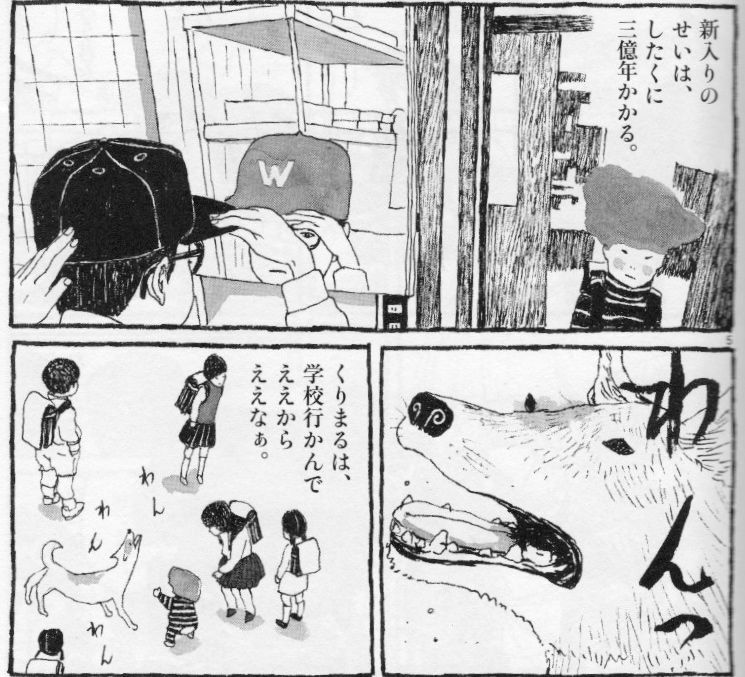 I love the way Matsumoto draws animals. Oh, I’m so sorry you don’t get to come! I would’ve loved to grab a drink or something with you. And the exhibition is really something you need to see. It looks like it’s going to be great. Plus you would get to meet Matsumoto in the flesh! He is super nice! My fingers are crossed that you at least get a French translation of Sunny to enjoy soon. I think it really is my favourite thing he’s done. And I agree with you one hundred percent, I love the way he draws animals. The dog in Sunny makes me smile every time he appears on the page. Oh yeah! I forgot about the dog and the cat chatting with each other. Thanks for reminding me! And I’m with you in hoping for some very special announcements from Viz. Wouldn’t it be great if they were to announce G by E. E.?! Of course it would be ^^ . I’m trying not to dream about it ha ha 🙂 . Reading this has got me even more excited than I already was – you have an enviable job! I discovered Matsumoto just before tabling at my first comics show (in Japan! ), immediately latched on to his work, and have been constantly inspired since! Do you know if there’s any chance Japanese editions of Sunny will be available at any of the TCAF/JF events? I’m super conflicted as to whether I ought buy the English edition or not; it seems such a shame to go through the trouble of learning a language, and then miss out on the original text with all of it’s delightful nuances anyhow (and the Kansai region is where i lived in Japan to boot)! I’m glad I can help build excitement for this release. It’s such a great series. I’m not sure if there will be any Japanese editions of Sunny available to buy. I know the Japan Foundation will have the series in their library, though. The Beguiling might have/get it in stock. If you buy the English edition at TCAF, though, you apparently get this great poster. So it might be worth it to get the English anyway. But if you can read Japanese, I’d definitely recommend reading the Japanese. The nuances of the dialect (I am so jealous that you were living in Kansai! 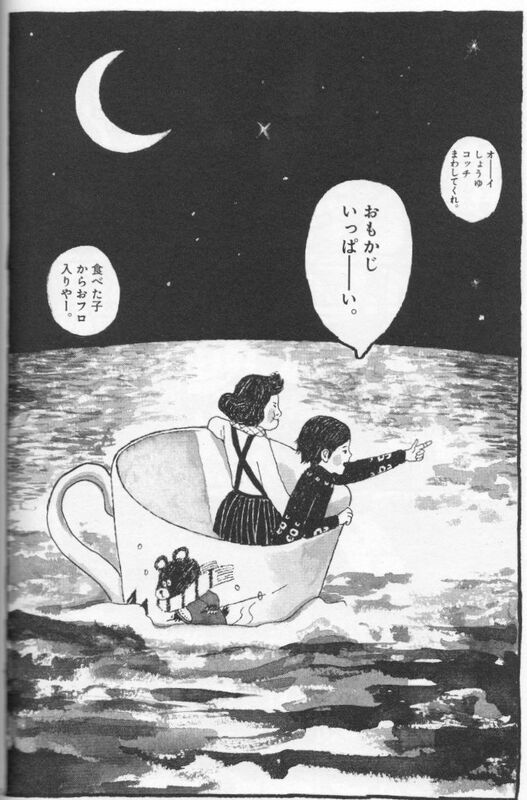 ), plus the things Matsumoto does with kanji/kana (like having names in hiragana when the kids say them, but kanji when the adults say them), really add so much depth to the characters and the story itself. And Matsumoto just has such a way with words that is hard to really capture in a commercial translation. Plus you get to read up to Book 3 in Japanese, while our poor monolingual friends have to wait months to find out what happens. That New York Book Off is great! Every time anyone I know goes to New York, I give them a list of books to pick up for me. As for the signing events, except for possibly the ones at the Japan Foundation, I’m pretty sure it’s fine if you bring an artist’s old work for them to sign. At least, I’ve seen people do that for artists I’ve worked with before and it seemed fine. I agree with you in everything you’ve said, and I share the passion and love you have for the work of Matsumoto, he’s a very unique and special artist. I’d like to know your opinion about the english edition of Sunny published by Viz, is it good? I think the English edition is gorgeous. I love that they decided to do it in hardcover. And like I said, the translation is good. Of course I wish the dialect could’ve been incorporated because I really feel it adds so much depth to the story, but I do understand why it was left out. Basically, if you can read Japanese, you should read it in Japanese to get all that extra depth. But if you can’t, the English version is worth reading. So glad to read that. Do you have any picture to see how it looks? I don’t have a copy of the English at hand to scan. But it is basically the same as the Japanese version, just in hardcover and in English. It’s handlettered and the font is basically perfect.